We've heard some rumors about what RIM had in store for its beleaguered BlackBerry brand, but we're just now seeing some evidence to support those claims. The fine folks over at BGR have gotten their hands on what appears to be a copy of the company's 2012 roadmap, as well as a handful of slides detailing some upcoming products. It looks like an HSPA+ equipped PlayBook is in the works, packing both NFC and a 1.5GHz CPU for good measure, as well as a pile of Curves aimed at the entry-level market. Something new those cheapo handsets will be bringing to the table is a dedicated BBM button, which should make addicts of the messaging service quite happy. Sadly, it also looks like the first BlackBerry 10 (formerly BBX) device may have suffered a slight delay and may not land till October or November. Hit up the source link for all the nitty gritty details. 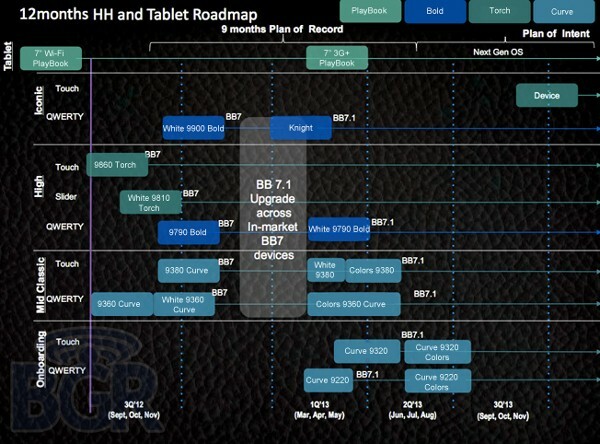 2012 BlackBerry roadmap leaks, reveals pile of Curves and 3G PlayBook originally appeared on Engadget on Thu, 26 Jan 2012 12:30:00 EDT. Please see our terms for use of feeds.